A crop of unusual-colored lobsters like these at New Meadows Lobster in Portland, Maine was believed to be extremely rare--blue was thought to be a 1-in-2 million find, while orange was 1-in-10 million and orange-and-black calico was pegged at 1-in-30 million. But reported sightings of standout colors like these are becoming more and more common. 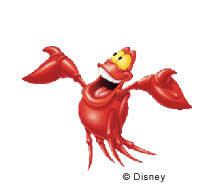 If you thought living lobsters were red like The Little Mermaid’s Sebastian, you were wrong. The delicious hard-shelled crustaceans are usually greenish brown, but in recent years, lobstermen are finding more of them in mutant colors—orange, blue, white, yellow—and no one is sure why. Color variation, which is caused by random genetic mutation, is nothing new. But odd-colored lobsters are becoming much more frequent than previously believed. Orange lobsters were thought to be a one-in-10 million occurrence—but a 100 lb. batch shipped to a Maine restaurant last month contained six of them, the Associated Press reports. No one knows what is causing the rise in unusual hues, or if the trend may be just an illusion. Researchers suggest the apparent rise may mean we simply underestimated the frequency of abnormal colors: perhaps we are now more aware of them because the popularity of online photo-sharing has made it easier to spread the word. Or maybe we’re catching more out-of-the-ordinary crustaceans simply because we’re catching more of them overall. Lobster catch rates have quadrupled over the past 20 years, so the number of oddballs in the batch would naturally increase as well. Even amid the long-term rise, this year has seen a surge in lobster catches. This year’s record temperatures have caused the critters to shed their shells about six weeks earlier than expected, creating a surplus of catch-ready crustaceans. The yummy little clawed monsters have been so plentiful that lobstermen are trying to slow their catch to keep prices up. Because the boost has been in soft-shelled crustaceans that can’t be shipped long distances, prices have only fallen in the Northeast. But don’t expect to see the colors of the rainbow on your plate: all lobsters turn red when they’re cooked.